So, I officially have started my maternity leave! In theory, maternity leave is supposed to be a time of relaxing and waiting for baby to arrive, but we have so much to do before that happens. I don’t know any mom who was able to kick back and read baby books while eating bonbons and sparkling apple juice (or ice cream and pickles…whatever your craving is today). It’s all about getting those last few things done before you have a new little person who needs you 24/7. Happy MLK Jr. Day! It’s a holiday, which means Lil’Man’s daycare is closed. But it’s not a mandatory holiday, so the Mr has to go to work. So, really, my first day of leave is pretty unproductive, but I gotta say: Lil’Man was awesome. He’s in his terrible 2s stage and I was expecting a rough day, but he was great. 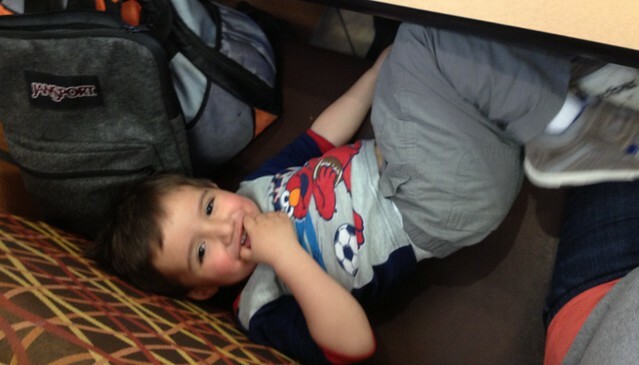 I even took him out to eat lunch at his favorite place as a treat. The day was exhausting (most things are these days), but the Mr came home to a messy house — legos, throw pillows and laundry EVERYWHERE — but a pretty happy kid and mom. This is when I started getting stuff done. The nursery is in dire straits — boxes everywhere, picture frames for the entire house stacked up along one whole wall, half the curtains draped over a bin full of wall paint samples, a new rug and pad rolled up and leaning in the corner, stacks of mail in need of sorting sitting on a console that needs to be moved the the family room…in general, it’s just a mess. On top of that, the room is missing some essentials: a crib mattress, a changing pad, and a diaper pail to list just a few things. So, a trip to Babies R Us was in order. I was able to pick up most of the missing items. In an ideal world, Lil’Man would be potty trained and wouldn’t need his changing pad or diaper pail. But this isn’t an ideal world and we are in the midst of what looks to be a loooooong period of potty training. 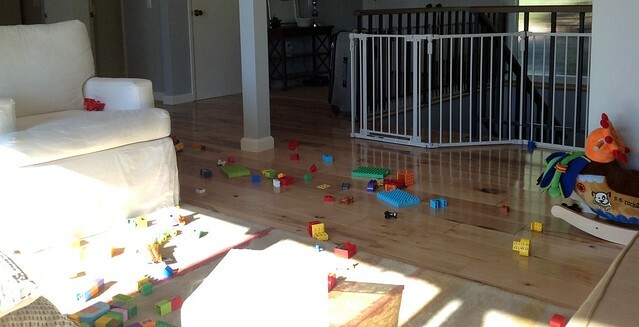 I know that some families manage to train their tot over one intense weekend (more or less), but not us. We are taking it a day at a time. He’s doing fine (he does better at school, where his friends are all training as well. Ah, peer pressure starts so early) but he’s not quite ready to ditch the diapers 100%. Anyhow, we love the Diaper Genie we got for Lil’Man, so I got another. The changing pad we got him is great, but now that he’s so tall, he’s complaining about how short it is. I got a longer, 2-sided pad that I’m hoping he likes better. Then, we’ll swap the smaller one into his sister’s room. 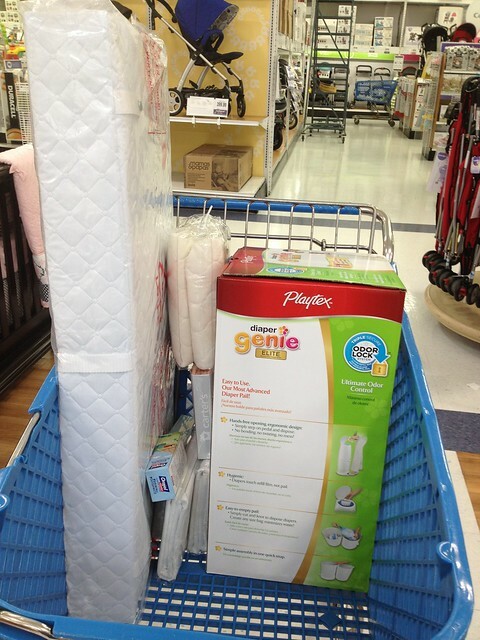 I also grabbed some crib sheets and a few cute newborn outfits that were on sale. Unfortunately, the scant selection of crib mattresses left something to be desired. I really liked the organic mattress we’d gotten for Lil’Man and it’s held up really well. He’s still using it in his toddler bed and finds it suitable for his sleeping and jumping needs. I was pretty sure I knew the brand, but I wasn’t seeing it in the store anymore. I left without buying a mattress, but as soon as I got home, I checked Lil’Man’s bed. It was the brand I remembered (Stearns & Foster), but I also checked the manufacturer: Kolcraft. Turns out they make more than just S&F mattresses. I hopped on Amazon and found just the right mattress for my little girl: a Sealy mattress that was nearly identical to the S&F mattress, but for about 1/2 the price (more due to an Amazon discount rather than the actual retail). I ordered that, plus some NB diapers (because that was just another thing we were lacking). I finally picked up a key piece of art for the nursery that I had decided to have professionally framed. I’ve used the company before to frame tons of stuff and never had a problem. For some reason, though, this print had gotten lost in the system. I sent it off and never heard from them — not even an invoice or bill, which had me particularly worried. I don’t know what happened, but after 2 months of speaking with them on the phone and meeting once with the owner face-to-face, they finally were able locate my print and get it framed beautifully. After that, I spent the rest of the week keeping my prenatal appointments, attending daycare parent/teacher meetings, working on other projects around the house (like hanging some art in the kitchen and finally taking down the Christmas decorations) and running errands like returning a Nest thermostat (which the Mr had me buy on my way home when he mistakenly thought a contractor had broken ours), purchasing some hardware at OSH to update our doors, and buying ELFA for an organization project. I know that my two main goals are paramount, but there’s so much to do around our house that I can’t possibly ignore other little projects.